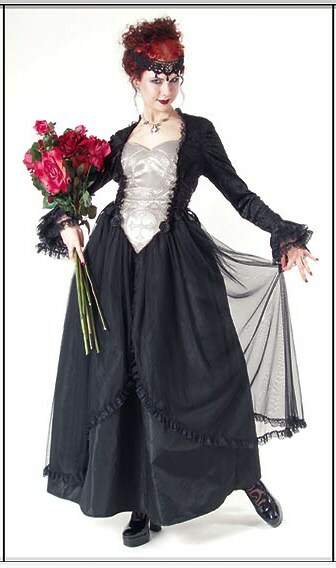 Eternal Love Pewter Gothic Crucifix+ Roses Belle Dame [5119P/R] - $98.59 : Mystic Crypt, the most unique, hard to find items at ghoulishly great prices! Eternal Love Pewter Gothic Crucifix + Roses Belle Dame Dress Another successful new version of our famed Belle Dame Dress, this time with the center front in a hand-cut Pewter Ecclesiastical Crucifix Brocade. The rest of the top is in stretch, black panne velvet, over skirt in poly-mesh, underskirt with secret side-pockets in crisp, black, acetate taffeta. 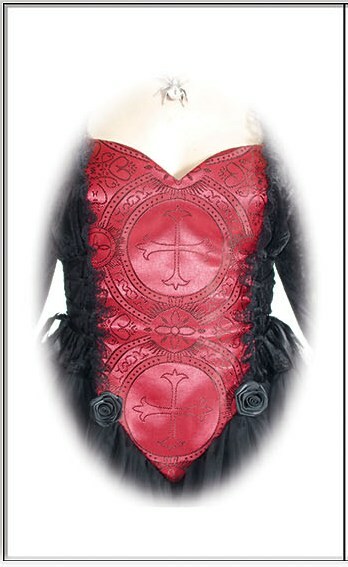 We are generous with the shirred lace trim & satin-rosettes. Adjustable sides with ribbons & loops. There is an 8 inch cinch which will allow this dress to fit a variety of sizes for the perfect fit. Ball gown floor length dress. This is a hot number! Very comfortable and fully adjustable. Please read measurements carefully! There is a lot of adjustment with lacing on this dress! * 2nd Picture below will show pattern of crucifix in scarlet, this crucifix will be pewter.